After reading a pre-release review of this novel, I had to preorder it. When it arrived, I read the whole thing that same day and then sat down to write this review. That alone should suggest how highly I recommend this book. If you’d like to skip the rest of the review, then: just read this book. I don’t think you’ll be disappointed. This is a book that will stick with the reader, and it’s deep enough that everyone will take away something a little different. I know it will be in my mind for a long time. 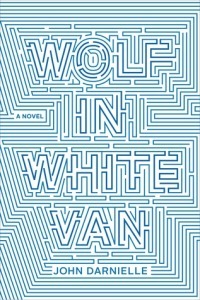 Wolf in White Van, written by The Mountain Goats songwriter John Darnielle, has already been favorably reviewed online, featured on NPR, and been nominated for the National Book Award. All the praise is well deserved. On the surface this is a story about Sean–the survivor of a terrible teenage tragedy, currently the game master of a play-by-mail role-playing game–and his reflections on life and the game. At its heart, it is a story about the power of imagination, about coming of age in a time when being a geek was far from cool, and about dealing with life-changing and traumatic experiences. The story is told through Sean’s inner monologue and shifts between the present day and his childhood, occasionally using scenes from his game, Trace Italian, to add to the story. Through these shifts in time, we see Sean’s current situation and the past experiences that have shaped his circumstances. Throughout the story we are given a deep look into Sean’s mind and his imagination. For a book about a geek and a role-playing game, this is an incredibly rich and literary story. To reveal too much would be to the reader’s loss, and I think it is a shame that some reviewers have directly revealed Sean’s condition. You’ll figure it out early in the story, and while not really a plot twist, Sean’s inner monologue takes time to get to the truth. I feel you should have the opportunity to go down that path on your own. Readers of this website will, I imagine, find a great deal to reflect on during this tale. The power of imagination, especially escapism, as the central theme will more than likely strike a chord with geeks and anarchists. Without imagination, how can we be geeks? Without imagination, how can we imagine a better world? Sean’s story, in part, reminds us that even in the darkest of situations our imagination can also be our liberation. But the story also remind us of the dangers of escapism. Living too much in an alternate reality can leave us ignoring what is happening in the real world, and Sean’s story examines both sides of the power of imagination. For those of us geeks of a certain demographic, the ones who come from a time or place in which a geek identity wasn’t cool or even understood, this book will bring up powerful memories. (Remember those days? Before World of Warcraft, Pokemon or Harry Potter. I might be wrong, but I feel like the only superheroes who were cool, at the time, were maybe Superman and Batman.) I am just old enough to recall the D&D scare of the 80s, and I remember my mother seeing a part of one of those anti-D&D TV movies and saying, “I’ll never let you play that game.” Thankfully, in my case, it was simply one of those things parents say and forget about. I however, didn’t forget,t, and for a long time I kept my D&D stuff hidden. Actually my Grandma ended up buying me my first copy of Dragon Magazine, because she thought I’d like the cover art. (I did, and Grandma, you were always cool. Thanks.) But I remember. I even did an experiment were I placed my secretly-acquired Dungeon Master’s Guide on top of my free Sunday School bible. Hiding the stack under the bed [it was on top of the bible under the bed? Or did YOU hide under the bed? ], I waited to see if anything happened. Nothing did. At the time (maybe 6th grade) my family and I weren’t particularly religious, nor was anyone specifically preaching to me about the “dangers” of D&D. I simply tell that story because those feelings were in the air. From the bookstores to the library, if you were looking at “those materials” someone would give stare at you. It was a time when you had to cover your Star Trek novel or you might get beat up. Geek was not “cool.” If you lived it, you remember, and this novel captures that period magnificently. The memories and inner dialogue of Sean will resonate with you. You will relate to his struggles. It will bring back memories, good and bad. It will bring you back to those days when you first read fantasy and science fiction and your imagination was going at warp speed. This novel will likely uncover some old memories. In the opening pages of the story, as Sean’s situation is revealed, I had some concerns. How is the author going to handle Sean’s disfigurement and situation? Will his condition feel like just a trope? The red flags were going off. But the author created one of the most “real” characters I have read in some time. While I have never experienced a physical and emotional trauma like Sean, he feels real. Sean is treated with respect. His emotions are that of a real person, and again, while I cannot completely step into Sean’s shoes, I can see these thoughts. After reading a couple of interviews with the author, I learned that Darnielle a survivor of abuse and has worked as a psychiatric nurse. That experience comes through in his writing, as he gives an authentic voice to his character. As I was reading, I felt my criticism was going to be that there wasn’t enough there. It’s only a 200 or so page book. I wanted more detail. I wanted things to be filled in. I wanted to know more about the games Sean was running. But as I finished the book, I think I realized that the lack of information is kind of the point. We aren’t given the whole story, but the story which we are given is about imagination. The power of imagination to create and to heal, the power to take us to dark places. As we fill in the “holes” in the story, we let our imagination go. Will our own imaginations paint a dark or happy end? Or perhaps as this story suggests, it is never about the end. It is always about the journey. The journey of our own imaginations can be dark, it can be powerful, it can be beautiful, but most of all its power is that we create it ourselves.